Please find instructions for setting up development environment for i8 here. The COSMOS demo and SDK provided on the download page include some examples for creating data managers or management data repositories (MDR). Developers are encouraged to run the demo program to get familiar with the functions provided by COSMOS, and use the examples as guidance. The following diagram depicts the class hierarchy of the COSMOS data manager framework. Note the symmetry of the diagram. Classes on the left are implementation classes of the server logic. APIs are exposed through the Java interfaces in the middle of the diagram. The same set of interfaces are used by remote client classes on the right side. The AbstractDataManager class provides basic functionality for registering with COSMOS brokers and handles various resource management and configuration capabilities. AbstractMdr class provides a framework for providing logic for interpreting a CMDBf query, and translating the CMDBf query to a language that the application understands. To create a data manager that does not support CMDBf query, you will need to subclass from the AbstractDataManager class, and provide custom APIs to expose application functions as web services. For example, the logging data manager provided in the SDK has the following class hierarchy. 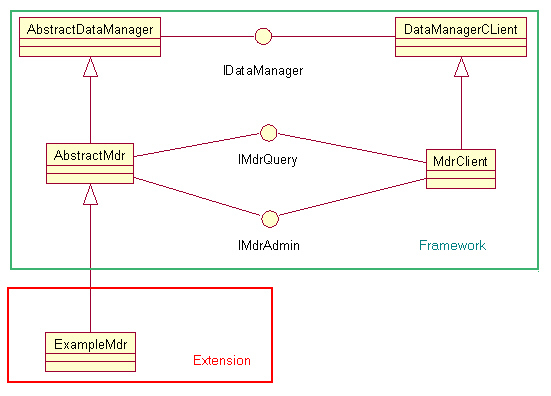 To create an MDR, subclass from the AbstractMdr class, and provide the necessary implementations to extend the CMDBf query interpretation framework. More details about how to extend the framework will be provided in the next section. The SML repository MDR provided in the example has the following class hierachy. This section has step-by-step instructions for creating an MDR. Create a plug-in project: In the "Target Platform" section, select "an OSGi framework", and select "standard" from the dropdown box. Click next to provide plugin ID, name, etc, and click Finish. Create a class in this bundle that provides the implementation of the MDR. This class corresponds to org.eclipse.cosmos.example.mdr.ExampleMdr in the Example MDR in the SDK. Implement the getQueryHandlerFactory method, which is an abstract method from the super class. This method should return an instance of org.eclipse.cosmos.dc.cmdbf.services.query.service.IQueryHandlerFactory. A query handler factory is a factory class that creates handlers for CMDBf query. 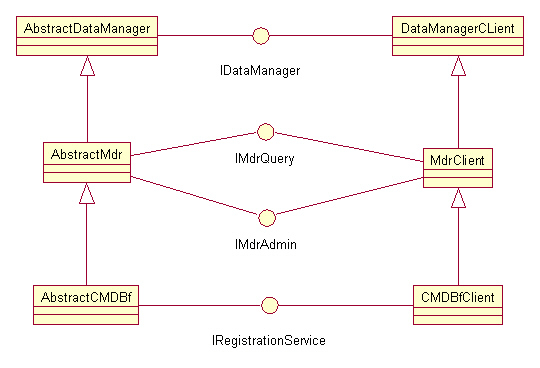 Read more about the CMDBf query processing framework from the Providing a CMDBf Query and Registration Service wiki page. Implement the getDataManagerInstance abstract method. The method will return an instance of the class that implements the capabilities. The activator will look like the following. A data manager can expose operations that are not part of the CMDBf specification by providing a custom capability and implementation. The steps for creating the implementation bundle is same as those used to create a basic MDR as described in the previous section. The difference is that the data manager implementation class will also implement the custom capability API in the class declaration, and provide the implementation in the class. Subclass from MDRClient or DataManagerClient when you need to provide a client proxy of a data manager that provides custom capabilities. Create a new OSGi Framework profile. Select all plug-ins in the workspace and deselect all plugins in the Target platform. Then click on "Add Required Bundles" button. Then click the "Add Required Bundles" button again. This page was last modified 12:52, 4 February 2008 by David Whiteman. Based on work by Hubert Leung and Eclipsepedia user Amehrega.ca.ibm.com.